Tweet Celebrate the release of The Challengers by Greg R. Fishbone! This is the first book of the Galaxy Games series, published by the Tu Books imprint of Lee & Low Books. In this hilarious middle-grade romp through space, eleven-year-old Tyler Sato leads a team of kids representing all of Earth in a sports tournament against alien kids from across the galaxy. Join Greg during the month of October for the Great Galactic Blog Tour! Every day for 31 days, Greg will spotlight a different children's literature blog with book giveaways, author interviews, in-character interviews, excerpts, deleted scenes, and more. Happening right now is the Launch Day Giveaway. There are lots of ways to enter! The Challengers is available now from online and offline booksellers and as an ebook. Read more about the Galaxy Games series and be sure to follow the Blog Tour! Interview with Tommy Greenwald. Author of the wildly popular, Charlie Joe Jackson's Guide to NOT Reading. 1. What inspired you to write a guide to not reading? My boys, Charlie, Joe and Jack, all hated to read growing up. It was very hard to find books that interested them. I figured one book they might like was a book that taught them how to avoid other books. And I knew that there were a ton of other kids out there - mostly boys - who hated to read too. 2. Are you anything like Charlie Joe? Did you also hate to read? No, the weird thing is that I loved to read. That's why it bummed me out that my kids hated it. Don't get me wrong - they're great kids. Not reading is literally their only flaw. Well, that and complete disobedience. 3. You mentioned your sons Charlie, Joe and Jack, how did they influence you in your writing this book? They influenced me in several ways. First, their aforementioned aversion to reading. And second, the fact that they plan on going to college some day, which is EXPENSIVE, so i needed to figure out a way to make some extra dough. I'm hoping to earn enough money from my books to at least pay for their text books. 4. Did it take longer than a summer to write your book? Tell us a little about the time it takes to write until the time to publishing? The first draft took about three months, back in the fall of 2009. I got very lucky because editors were interested right away, and I ended up with the wonderful Nancy Mercado at Roaring Brook Press, which is part of Macmillan. Then, of course, the real work begins. I revised for about another six months before the book was ready to go. 5. Who are some of your favorite children's book authors and how have they inspired you? I always loved the book ARE YOU MY MOTHER? as a kid. I think it's still in print. I loved the Matt Christopher books. Shel Silverstein is a master of all trades. And i think my friend Lauren Tarshis writes beautiful books. And Mary Stolz's THE BULLY OF BARKHAM STREET is still a fave. 6. Did you have laugh out loud moments when you were working on this book? Tell us about them. The funniest thing about writing this book was trying to get my kids to read it while i was working on it. They would promise to read it, and then put it off. That happened about a thousand times. It was like life imitating art imitating life. 7. Besides writing this book, what are some other ways you can think of to encourage kids, especially boys, to read? It's a good question. I do a writing exercise when I do school visits - I have all the kids write the title and first sentence of a book they would want to read. Then I read them all out loud to the whole class. They're usually hilarious. I think it shows the kids that there are books about EVERYTHING - and somewhere out there there's a book for them. 8. What is your favorite part of the writing process? Finishing. I love to tell stories, but I'm inherently lazy, and I'd rather be watching TV or playing with my dogs or eating ice cream then writing. I can find any reason to avoid writing. I should write a book called TOMMY GREENWALD'S GUIDE TO NOT WRITING. Visit the author's website at www.tommygreenwald.com. Thank you to author, Tommy Greenwald, for the awesome interview. I appreciate the funny and candid answers and I loved Charlie Joe Jackson's Guide to NOT Reading. I'll be anxiously waiting for Mr. Greenwald's next book. Click here to read my book review of Charlie Joe Jackson's Guide to NOT Reading. Here is your chance to win the wildly popular Charlie Joe Jackson's Guide to NOT Reading. This is a hard copy signed by the author. To enter, use the rafflecopter form and leave a blog post about what you or your child would like about the book. Or if you have read the book, post what you liked about it. Winner is chosen by www.random.org. and will be announced the day after it ends. A big thank you to the author, Tommy Greenwald for providing the signed copy of the book for the giveaway. Though the author provided the prize, it in no way influenced my review of the book. Attention non readers, book haters, and reading homework slackers, I have found the book, uh hum.. I mean guide for you, Charlie Joe Jackson's Guide to NOT Reading by Tommy Greenwald. If your parents catch you consulting this guide, do NOT tell them you got the recommendation from me. To say that Charlie Joe Jackson hates reading would be the understatement of the year, maybe even the understatement of the century. He would do anything to get out of reading, even buy a friend ice cream sandwiches over many years to get him to do his reading for him. When that abruptly comes to an end, Charlie Joe resorts to plan B. A plan so elaborate it involves bribery and manipulation. Worse, it involves setting up the girl of his dreams with the nerdiest boy in school. No matter what happens, Charlie Joe must find a way to keep his perfect record of not reading a book even if that means writing one instead. 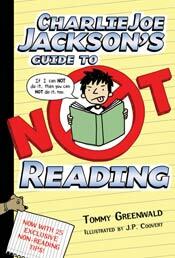 Anybody who has ever had a middle grade non reader or if you are of those middle grade non readers will agree that author Tommy Greenwald hits it right on the head with his non reading tips spread throughout Charlie Joe Jackson's Guide to NOT Reading. As a parent of a twelve year old reluctant reader, I have heard many of the excuses in the book. Reading the book with my son has given him some new ideas. The book really struck a chord for both of us and is one of the first books my son asked me to keep reading even when I was ready to be done. Charlie Joe Jackson's antics made both of us laugh several times. Charlie Joe is a likable hero who every book hater can relate to. Unlike Charlie Joe's tip #25: When you are done with a book, never look at it again, the non-reader will want to look at this one again. I admit, I had to pay my son to read the book with me, but it is the only book I've reviewed that he has asked to keep and one in which I gladly purchased for him. Not only would I highly recommend this book to the reluctant reader, I would highly recommend it for the child who loves to read too. Ages 10-12. Click here to purchase from Barnes and Noble. Here is your chance to win a hardback copy of The Fourth Stall by Chris Rylander. Just use the rafflecopter form to enter. Thank you to the publisher, Waldon Pond Press for sponsoring the giveaway. Though the book was provided by the publisher, it in no way influence my opinions about the book. Got a problem you can't solve? Get in line outside the East Wing of the boys bathroom where Mac will meet with you in the fourth stall. For a fee, Mac can get you just about anything, test answers, a bully to leave you alone, even a chance to take a girl to the movie you're not old enough to get into. Business is booming for Mac and his best friend and business partner, Vince. They might even end up with enough money to see the Cubs in their first World Series game in almost seventy years. That is until a third grader named Fred shows up in need of protection and turns their plans upside down. Mac and Vince find themselves in the middle of gambling ring led by the notorious a high school crime boss, Staples. They must employ every business tactic they know, including getting every bully in school involved. They risk not only losing their business, but their friendship as well when they find their own problems are the hardest to solve. The Fourth Stall starts out as a hilarious and turns into a mob like who done it middle grade mystery novel. Chris Rylander does a meticulous job covering every aspect of the mystery in a humorous setting that is sure to grab the attention of the hard to please middle grade school boy. The characters are well developed and I I was particularly drawn to Vince who is funny in a quiet way. I loved this novel as did my husband and twelve year old son. Chris Rylander leaves the ending open for a follow up novel which I can hardly wait to read. Highly recommended for ages 9-13. Tweet Congratulations to the winners of the blog contests. Wolf Mark by Joseph Bruchac goes to Christine A.
Spartacus and the Circus of Shadows by Molly E. Johnson goes to misusedinnocence. Winners have been notified by email. If you are the winner and did not receive your email, please contact me via the email address in the contact me section. Thanks to all who entered the contests and support my blog. In honor of Blogger Appreciation Week, I am giving away an ARC copy of Spartacus and the Circus of Shadows by Molly E. Johnson. I absolutely loved this book. It was very funny. 1. 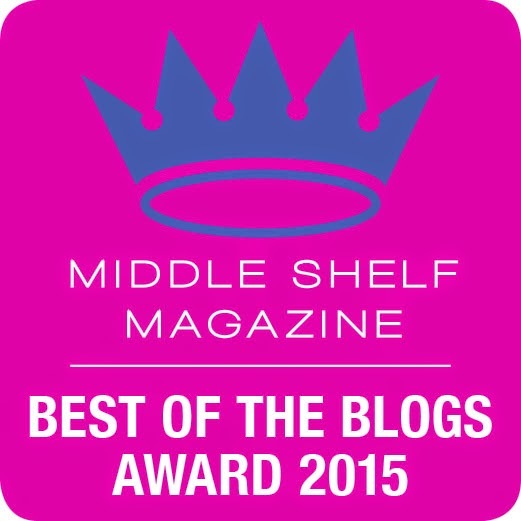 Mandatory entry: Leave a comment on this post and mention something you love about book blogs. Be sure to leave your email address in the post in this format. yournameatgmaildotcom to keep spammers from contacting you, but to allow me to contact you if you are the winner. 3. Post this link on your Facebook page and leave an extra comment that you have done this. 4. Become a blog follower on this blog and comment that you have done this. Maximum of 5 entries and each entry will have a blog post. Each post is assigned a number and the winner is picked by www.random.org. Contest ends Sept. 16, 2011 at 10 p.m. MST and winner will be announced and contacted Sept. 17, 2011. Open to US and Canadian residents only. Please note: The cover of the book may differ from the actual cover as you will receive the ARC copy. A special thanks to Raintown Press for sponsoring the book giveaway. Disclosure: Though the publisher is sponsoring the giveaway, my opinions about the book have not been influenced by them. It was just five months ago I started a blog on boys and literacy. I watched my daughter excel in school because she loved to read. Then my sons came along and it was a new story. I watched one of them lag behind and wondered how I could instill the love of reading into both of them. While it was easy when they were young, as they entered their tween years, it became harder. Suddenly, it wasn't 'cool' to read. I knew there were books out there they would love, I just had to find them. I knew others struggled with the same thing. I read reports that showed boys lagged behind girls in reading. I couldn't help but wonder how we could come so far with girls and so far behind with boys. As happy as I was that my daughter had opportunities she wouldn't have had fifty years ago, I didn't want that to be at the expense of my boys. I wanted all of my children to have equal opportunities I was passionate about it. So passionate, I started my blog. Little did I know what I was getting myself into, especially when I started accepting books and writing reviews. The time involved to blog about these books I love, was much greater than I anticipated. 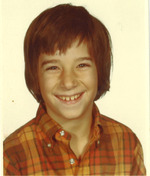 I am also a writer of middle grade books for boys working on getting published and blogging was taking precious time away from that. At the same time, the reading and writing I spent on the blog was making me a better writer. Why do I write this? So authors, publishers and even readers will understand the work that goes on behind the scenes for book bloggers and take a minute to appreciate that work. A quick thank you in the comments section or a blog or Twitter follow is all it takes. 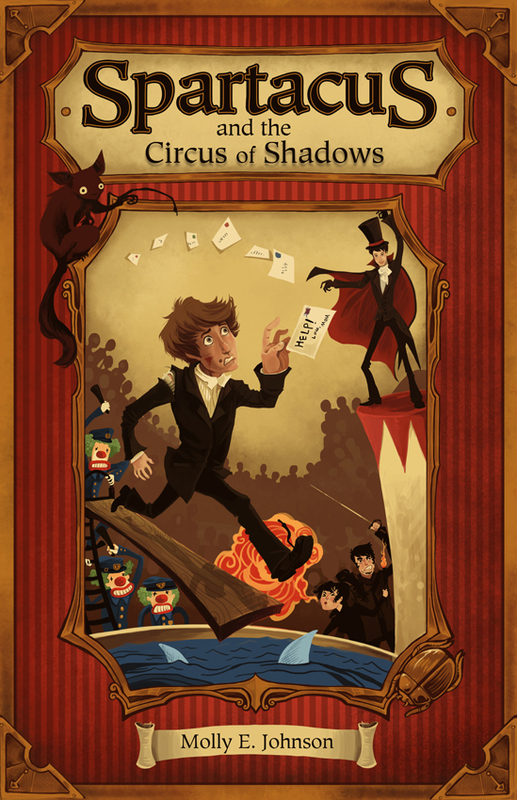 In honor of blogger appreciation week, I am hosting a book giveaway of Spartacus and the Circus of Shadows by Molly E. Johnson. Please click here to enter. Drawing ends on September 16, 2011, the last day of blogger appreciation week. 1. I read you have written over 120 books. Do you have a favorite and if so which one? writing another book about him. 2. How hard was it to get your first book published? be more on the mark. package arrived in the mail with poor manuscript and another rejection letter in it. worth of rejection letters. Every one of them, even the polite ones, felt like a knife in my heart. else's, to gain the distance to be more objective, and then to revise and make it better. 3. 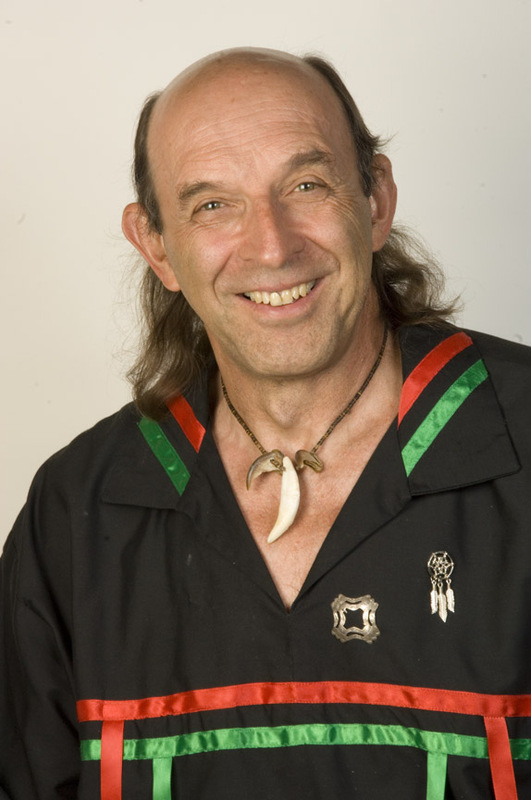 Beside the fact that you are of Abenaki descent, what other reasons did you decide to inlcude Abenaki characters in your books? I felt that many of the aspects of Abenaki culture that I knew really tied in well with the story. 4. Is Wolf Mark the first novel for young adults you have ever written? by Will Davis and published by First Second Books with the same title of DAWN LAND. 5. Is there anything about Luke that reminds you of yourself? to the natural world, and like me feels happiest and most at ease when he is in the forest. in grade school) and for Russian literature. art of Pentjak (or Pencak) silat. of hopeless first love. And I shall say no more about that! 6. How did you come up with the book idea for Wolf Mark? lives--even though I believe they need good stories even more in their teenage years. a Writing Fellowship, to Syracuse University where I got my master's degree. 8. As an established writer, do you ever get any book rejections? some people just can't write for the YA reader. 9. So many middle school and high school boys are reluctant readers. What would you say to them? reading or more likely, wanting to read. You just haven't found the right books yet. Don't feel bad if you don't want to read the books that people say are "good for you." Maybe you're not ready to read those books yet. Read the things that you enjoy reading. being a good reader will be useful to you for your whole life. Click here to win a copy of the awesome young adult novel, Wolf Mark by Joseph Bruchac. A great young adult book to add to your collection. Young adult books written with a strong male protagonist are often hard to find. Wolf Mark by Joseph Bruchac is like finding a hidden gem. A well written, suspense filled paranormal book for the teen boy. I loved this book. It's sometimes hard to give away my review copy, but alas I must. Contest ends Fri. Sept. 16 at 9:00 p.m. MST. Winner will be notified by email. 1. Become a follower of this blog. Find followers on the right column and click. Leave a comment that you have followed my blog. (If you're already a blog follower and want to earn an extra entry you can do #2 twice on two separate days. 3. Become a Twitter follower of @boystobooks and leave a comment that you have done this. If you enter all 4 ways, you will have 4 comments and 4 entries. Winner will be notified by email and will have one week to provide mailing address or will forfeit the prize. Winners are chosen by www.random.org. Contest is open to U.S. and Canada residents only. A special thanks to Lee and Low an imprint of Tu Books for providing the book for the giveaway. Disclaimer: Though I received the review copy from the publisher I am giving away, it had no influence in my opinions of the book. I was not paid by the publisher or author to provide a favorable review. It's not very often that I find a young adult novel with a male protagonist so I was thrilled to review Wolf Mark by Joseph Bruchac. Lucas King doesn't like moving around every six months. After his mother's death, he and his father settle down, and Luke finally gets to live a normal life. Normal enough to have a best friend and to ask the girl he likes for a ride on his motorcycle. The only problem is that Luke is not normal. As a special ops infiltrator, his dad's job has always been dangerous. When Luke's dad is kidnapped and sends him coded messages in a phone conversation, Luke must find him and rescue him. All while learning his Native American heritage is more than he could have imagined. More than normal. After first avoiding them, Luke finds a group of unlikely pale faced Russian allies, the Sunglass Mafia, in his life or death search for his father. His interactions with the Sunglass Mafia are quite funny and non-stereotypical. Click here to purchase this book from Barnes and Noble. Tweet I am giving away a hardback copy of Chasing the Nigtbird by Krista Russell. It is a great historical fiction novel set at the time of the passage of the Fugitive Slave Act. Contest ends Sunday September 11 at 8:00 p.m. MST and winner will be notified by email within 24 hours of contest end. Winner is picked by www.random.org. 1. Receive one entry by commenting on this blog post. Please leave your email in this format yournameatgmaildotcom. 2. Receive an extra entry by following my blog and posting a comment that you have done so. 3. Receive an extra entry by tweeting this message. 4. Receive an extra entry by posting this link on your Facebook page and commenting that you have done so. At fourteen, Lucky Valdera has spent a good portion of his life on the whaling ship, the Nightbird. After he is orphaned, he wants to return to the sea. Unfortunately, his estranged half brother, Fortuna has other plans. Fortuna kidnaps Lucky, takes everything he owns, forces him to work in a nearby mill and keeps all of Lucky's wages, thus forcing him into servitude. Lucky is determined to escape his half brother's harsh treatment. Lucky's plans take an unexpected turn when he meets Daniel, a runaway slave and Emmeline, daughter of a Quaker abolitionist. Emmeline promises Lucky passage on her uncle's ship if he will help the Underground Railroad by preventing slaves from being rounded up by their masters armed with the passage of the Fugitive Slave Act. Lucky' character is aptly tested in his escape with Daniel. Author Krista Russell presents the moral dilemma with the Fugitve Slave Act in a climatic story by adding just enough historical background to aid the story, but not too much that it takes away from the character development. Strong characters and a well paced exciting plot make Chasing the Nightbird a strong historical fiction novel especially suited for boys ages 10-14. Emmeline is a strong, likeable character that will appeal to girls as well. Recommended. * Disclaimer: Though I have received a review copy by Peachtree Publishing, my opinions are not influenced by them in any way. I do not accept payments for book reviews. 1. Is Spartacus and the Circus of Shadows your first book? What inspired you to write it? Yep! This is my first book. There's too much going on in it, though, to name just one inspiration. My literary inspiration is easy to pinpoint. Spartacus and his voice were really inspired by Jerry Spinelli's Maniac Magee. I know, I know, that book is from forever ago, but I remember how much I loved that book when I was ten...and again when I was sixteen...and when I was twenty-two... I really started out creating a fantastic person in a normal world, like Maniac...but then, as it went on, I realized that Spartacus was really just a normal kid in fantastic circumstances. 2. How long did it take to write Spartacus? This is kinda embarrassing... Spartacus was my undergrad thesis and then my graduate thesis-and it started out as just a short story. I've been working with this character on and off for...um, ten years. I know, it's ridiculous. I re-wrote the story four times: once for each thesis, once when I left a laptop with the only digital copy in the back of a cab in China (ARGG!!! ), and once after RainTown accepted it. I feel like Spartacus exists in about fifty different realities where everything has happened at least once. If I hear one more person say, "Hey wouldn't it be cool if Spartacus..." and it's something that was in one of the other versions, I'm gonna scream. 3. Are any of the characters in your book based on anybody you know? If so, explain. I'd say 90% of the names have connections to friends-and Lousy the cat was a real, whiskey-drinking cat I knew of. But the biggest connection would be with Will and my older brother, Casey. His wiliness is definitely sprinkled throughout Will's character. When I was Spart's age, I suspected Casey was always one step away from doing something atrocious. But I think Will's attention to Spartacus is totally misunderstood-as I suspect my brother's was too. From Spart's perspective, Will is a complete jerk, but if you take a step back and look at Will's actions-I mean, the sheer amount of time Will takes to plan and carry out his pranks could almost be flattering (that is, if they didn't end up so badly for Spartacus). I dunno. Call me sentimental. I like to think my brother really liked me and that's why he got me to lick the driveway, or smell his feet, or clean his room, right...? 4. What is the most surprising thing you learned in writing and publishing Spartacus? Discovering how huge the MG/YA community was! I mean, I was on Twitter as a normal person, talking with friends and stalking celebrities, but I never knew that everyone was out there, just Facebooking and blogging and tweeting away-I mean, there's a #writingparty every moment! And I spent so many Friday nights where I typed away alone, feeling pathetic. It's really encouraging knowing you're not the only one slaving away. 5. What is your favorite scene or favorite part of Spartacus? Robin Marx, a character in the book, was an alias that carnies would give back in the old days. It was a play on the words Robin (i.e. robbing) and marks which were the suckers on the mid-way, spending money on junk. Get it? Robbin' marks? Circuses never, ever play the song Stars and Stripes Forever unless something goes terribly wrong. It's a secret code to let the performers know there is an emergency without frightening the audience...They call it the "Disaster March." 6. Do you ever get emotional about your characters or situations when you write? Explain. I don't think you can write some scenes if you're not feeling it yourself. One night in winter, while on a deadline, I was sick and exhausted and typing away at an emotional scene between Spart and his mom and I was really moved. (So moved, in fact, that I think the scene is a bit heavy-handed.) But at the time I wrote it, I knew how Spart was feeling because I put myself in his shoes. And, I've blogged about this, too, that I write with music a lot to get me feeling how I want the character to be feeling. It's a really fun writing trick. 7. Who are some of the writers you admired growing up? Do you have a writing mentor? I mentioned Jerry Spinelli earlier. I loved his writing while growing up and I still love it now. But I also wasn't someone who was picky about books as I could never get enough, so I read (and reread) a lot of crap right along side great books like Hachet (Gary Paulson), Forever (Judy Blume), The Indian and the Cupboard (Lynn Banks), and Charlotte's Web (E.B. White). And my writing mentor is actually my fiancé, who is also a writer. He's one of the few people I've met whose edits and opinions I trust-and whose edits and opinions I'm not afraid to argue with. 8. What is the hardest thing about writing? Being disciplined enough to do it! And then sitting down to do it, even when you feel like there isn't a creative thought left in your head. But when something does come out of that creative desert...it's really something. 9. Are you working on another novel? Tell us about it. I am, but it's barely out of that Desert Stage right now-I'm afraid if I even talk about it, it may dive back under the sand. But I'll keep you posted. 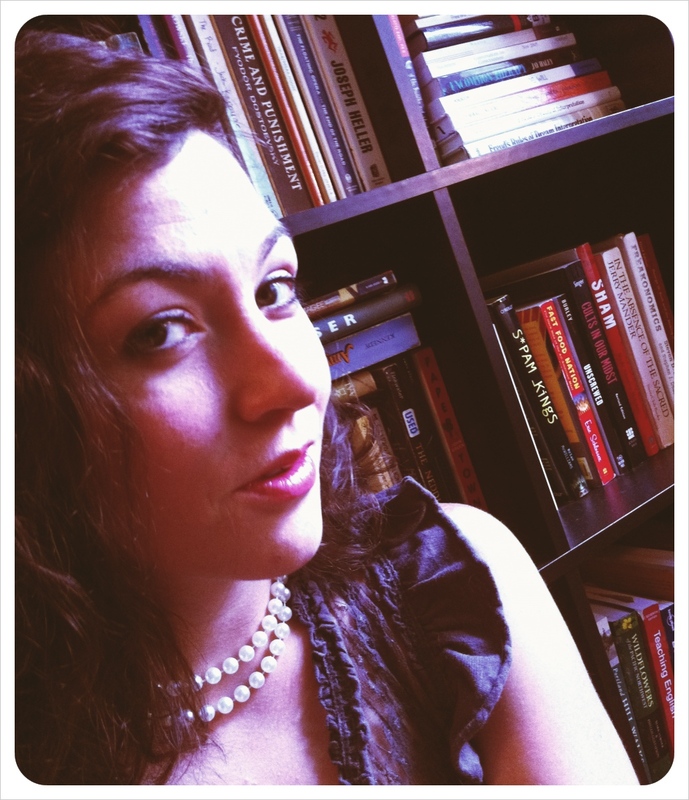 Thanks to Molly Johnson for a great interview and the insight into the writing process. I loved Spartacus and the Circus of Shadows. A very funny first novel. Congratulations! Click here for my book review.